Washington Free Beacon editor in chief Matthew Continetti said Friday that the Republicans most likely to remain in office after the 2018 midterm elections are the ones who are more receptive to President Donald Trump's "cultural appeals." 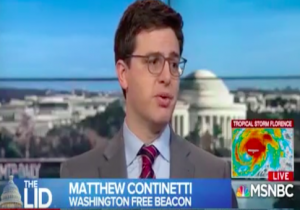 Continetti's comment on MSNBC's "MTP Daily" came after fellow guest Geoff Bennett, a reporter for NBC News, noted that "establishment" Republicans on Capitol Hill want Trump only to discuss two issues while campaigning for GOP candidates: the strong economic numbers and the expected confirmation of Supreme Court nominee Brett Kavanaugh. Bennett added, however, that the president instead focuses on "cultural issues," such as immigration and the national-anthem protests in the NFL, which excite the Republican base. Host Chuck Todd then turned to Continetti and cited his latest column, before saying that what works for Trump does not seem to work for the rest of the Republican Party. "No, but the paradoxical effect is, after this election, the Republicans who are likely to remain in office will be the ones who are much more receptive to the cultural appeals that Geoff is talking about," Continetti said. "It becomes a Trumpier party even as it shrinks." "Because the people who lose are the least Trumpy," Todd added. Continetti also discussed efforts by Republicans to portray all Democratic candidates as far-left progressives who support policy positions such as "Medicare for All" and to abolish U.S. Immigration and Customs Enforcement. "The Republicans want to highlight those candidates," he continued. "They want to nationalize it and to make it a choice between Trump Republicanism and the left-wing progressive movement. How successful they are, I think, is an open question because of this Democratic enthusiasm we see across the board."